One important thing that people have realized over the past few years is the importance of survival kits. So many disastrous events that have taken place in last few years showed how the entire world can be turned upside down in just a matter of few seconds. Floods, hurricanes, fires, tornadoes, terrorist attacks are just to name the few events that can come on the way of your normal life and leave you with nothing to do except for hoping to survive. Having a 72 hour kit ready can help you save your life as well as that of your family members. It is the handiest thing to have ready in case of a sudden emergency. Unlike what is popularly believed, survival kits are not always expensive. In most cases, a 72 hour kit can be prepared by items that can be found by combining items that are found in local grocery or hardware stores. However, it is important to understand that 72 hour kits contain just the bare minimum items that are needed to survive till the help arrives. In some cases, help even takes longer to arrive and in such scenarios the usage of survival items should be planned in a way to sustain them till the help arrives. The basic elements that should be included in all 72 hour kits are food, water, medicines, shelter, and first aid supplies. Water is the most crucial thing that is a must for survival. Proper care should be taken to make sure that the stored water does not get contaminated during disasters. While you can manage without food for few days, still food is needed to give you strength to keep you going till the services reach you. A set of dry clothing, winter wear, tent, sleeping bags, radio, flashlights, knife, diapers for babies, etc are some other items that can be included in a 72 hour kit. 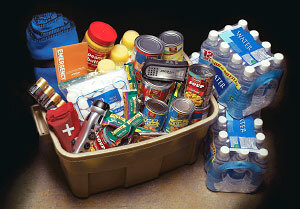 A 72 hour kit can really act as a live savior for you and your family during emergencies. With proper preparation and planning, you can always be ready to deal with emergencies. PREVIOUS POST Previous post: End Laziness With Excitement!